Editor’s note: This story contains graphic photos that may be upsetting to some readers. Domestic sheep transmit the deadly virus to bighorns when the two species mingle on public lands. Wildlife officials are supposed to make sure that wild and domestic sheep don’t interact. But according to a trove of Colorado Parks and Wildlife documents recently obtained by High Country News, they mingle more frequently than previously known. And though failures on the part of ranchers, federal agencies and state wildlife managers are often to blame, it’s always the bighorns that pay the price. See all of the documents obtained for this story here. Ranchers who hold permits to graze sheep on public lands are responsible for keeping their sheep out of known bighorn range. But domestic sheep often stray from their flocks. And when gregarious bighorns get too close, the ranchers’ herd dogs and employees sometimes fail to haze them away. Yet the permit-holders are rarely penalized. Instead, whether or not disease transmission has been confirmed, any bighorns known to have interacted with domestic sheep — like the ram in Fox’s lab — are euthanized to prevent the possible spread of disease to their wild kin. A domestic ewe trails a bighorn ram over rocky near Gunnison, Colorado, in December 2015. In April 2016 in a community west of Durango, Colorado, a young bighorn ram jumped over fencing on private property into a pen holding six Navajo Churro domestic sheep. The bighorn was euthanized. A stray domestic sheep wanders along a railroad track near Delta, Colorado, in March 2015. Though their current population numbers pale in comparison to the distant past, bighorn sheep appear to be expanding their range in southwest Colorado, a sign that the populations are healthy. Rocky Mountain bighorns are considered a species “of conservation concern” at the state level, but are not currently listed under the federal Endangered Species Act. But as the bighorns’ range expands, their encounters with domestic sheep surge. 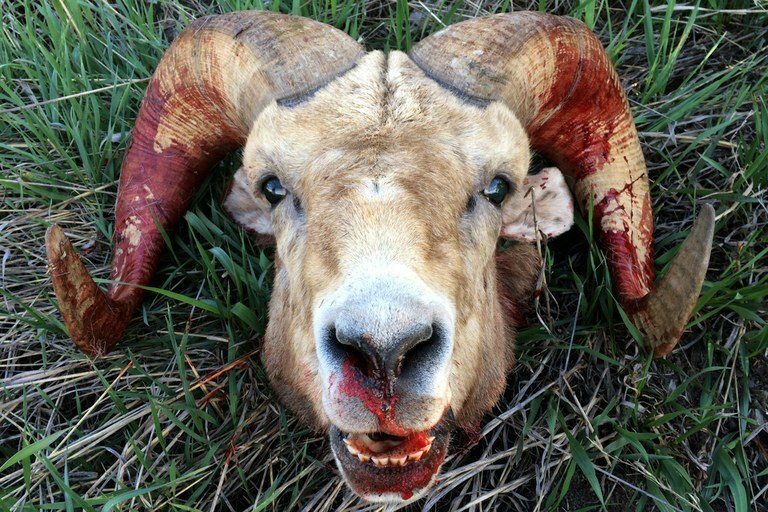 Wildlife biologists believe that disease transmitted from domestic sheep is the greatest threat to wild populations. Since 2015, Parks and Wildlife has killed nine bighorn sheep in southwest Colorado due to potential infection, a number that reflects confirmed encounters. Many more encounters are never witnessed, likely putting bighorns at risk. 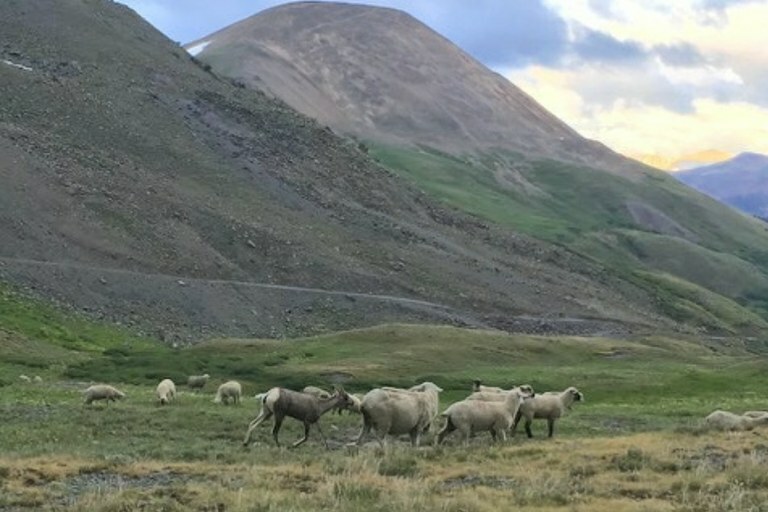 “We have a couple hundred domestic sheep allotments in the southwest and we have large, interconnected populations of bighorn sheep,” says Terry Meyers, the executive director of the Rocky Mountain Bighorn Society. “It’s just a hotbed” of conflict. Reports from wildlife managers and internal emails show that domestic sheep frequently wander into bighorn territory and vice versa. In August 2016, three bighorn sheep were reported 100 yards from a flock of domestic sheep near Silverton. State wildlife biologists believed hazing would be futile, because the bighorns would just return. “It was finally decided that the best course of action would be to destroy the bighorn,” one biologist wrote in a report. After the Placer Gulch encounter near Silverton, Colorado, in 2016, wildlife biologist Brad Weinmeister euthanized three bighorn. These photos were obtained through a Colorado Open Records Act request. In July 2017, two backpackers in the Weminuche Wilderness watched as a thousand domestic sheep spilled over a ridge and into their camp. Soon after, they noticed an out-of-place animal — a single bighorn sheep. 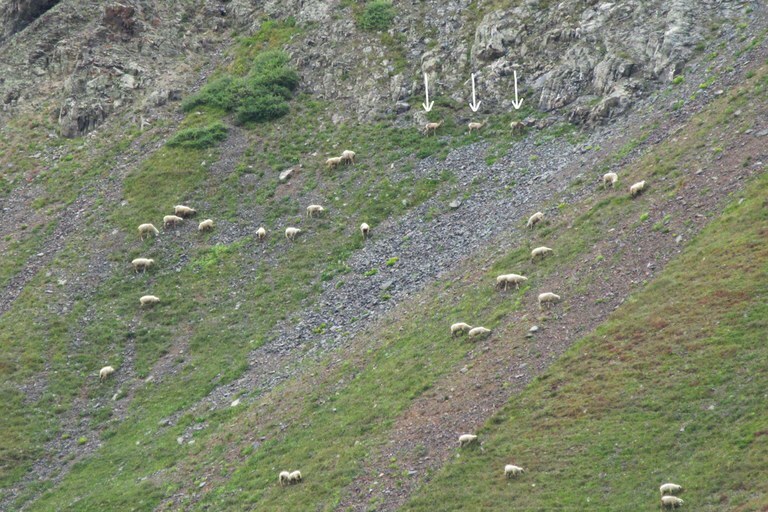 “He was trying to join the flock, nuzzling and sniffing the domestic sheep,” hiker Ben Perry remembers. “The herding dogs would notice him and a chase would ensue, but then after awhile, he would join back in.” Perry didn’t report the encounter until more than a year later, after reading a September HCN article about the issue. It’s likely that young bighorn rejoined his herd in the Weminuche Wilderness. A pair of backpackers in Colorado’s largest wilderness area, the Weminuche, spotted a young bighorn mingling with a flock of domestic sheep. The hikers didn’t report the incident until more than a year after the encounter, when they also submitted the photo to High Country News. In Conejos County in September 2017, District Wildlife Manager Rod Ruybalid received a report of nine stray domestic sheep. He found the wayward flock just west of Prospect Peak, an area frequented by bighorns where grazing isn’t permitted. Ruybalid tracked down the sheep’s owner, who explained that 13 sheep had escaped his ranch more than three months earlier. Ruybalid’s report details a grand chase — over three days — to capture the runaways. Eventually, the rancher gave permission to kill them, but four of the 13 still remain unaccounted for. Colorado Parks and Wildlife didn’t do much to punish the rancher for violating the so-called “no-stray condition” of his grazing contract — because, technically, the agency can’t. The Forest Service and Bureau of Land Management have authority over grazing practices on public land and are the only ones who can dole out penalties. Colorado Parks and Wildlife has jurisdiction over only the wildlife that roam those lands. On paper, at least, the agencies are required to work together and use “best management practices” to keep the species separated, including hazing bighorns away from grazing allotments with sheep dogs or gunfire. Ultimately, though, the feds make the final decision on how close to bighorn territory grazing is allowed. Proposed changes in Colorado’s management plans remain in limbo, because closing grazing allotments is highly contentious. In practice, a great deal of responsibility falls to permit-holders. One rancher, documents show, was commended by Parks and Wildlife officials as a “potential model” for “how these things should go.” Patt Dorsey, southwest region manager for the agency, wrote a letter thanking a Silverton-area permit-holder. “We appreciate that you and your herder noticed the bighorn sheep in proximity to the domestic sheep, attempted to haze the bighorns away, and called Colorado Parks and Wildlife,” she wrote. “You did things right.” That letter, however, was drafted after multiple strays from the same rancher’s flocks came into contact with bighorns, causing the killing of six bighorns in one year. Even then, the rancher did not face penalties. Three bighorn sheep are seen mingling with a flock of domestic sheep on Forest Service grazing allotment in Placer Gulch near Silverton, Colorado, in September 2016. Wildlife biologists killed the animals to prevent them from infecting their herds.